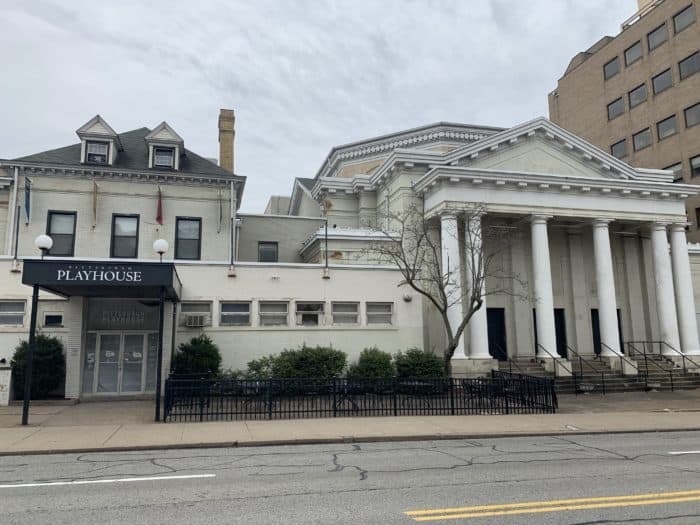 I recently read in the paper that Point Park University, who is the owner of the Pittsburgh Playhouse, is planning to demolish the former Pittsburgh Playhouse complex and old Tree of Life Synagogue. Of course, when I heard that I knew that I had to make a trip out to Oakland to snap a few pictures of the property before it is gone. After a recent doctor appointment in Oakland, I decided to swing by the Playhouse. The playhouse is actually made up of three mismatched buildings which we all built with theater being the last thing in mind. Even before Shirley Jones graced the Playhouse’s stage (before launching her Hollywood career), Pittsburgh had a long history of theater and the arts. The first building to be purchased was a former German social club which became the Rauh Theater. The lobby of the theater was made up of an adjacent house which was purchased by the Rauhs. The first performance of at the Pittsburgh Playhouse took place in the Rauh Theater in 1934. A view of the theater inside of the former Tree of Life Synagogue at Pittsburgh Playhouse. 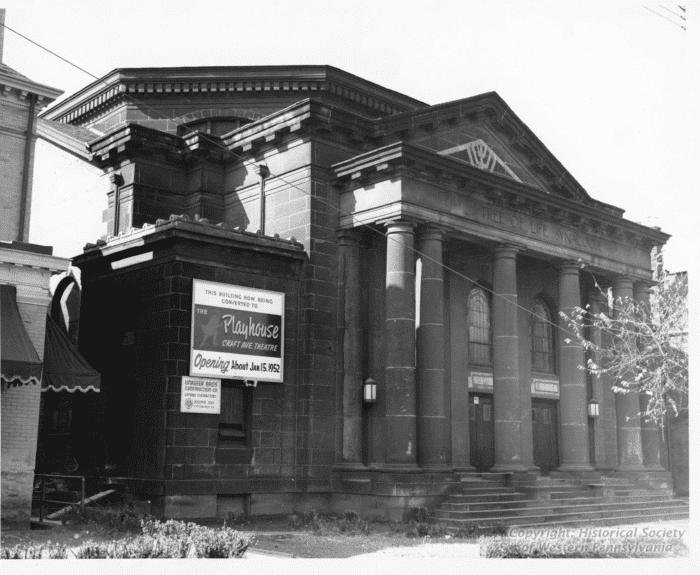 The third building to make up the Playhouse complex was the former Tree of Life Synagogue. 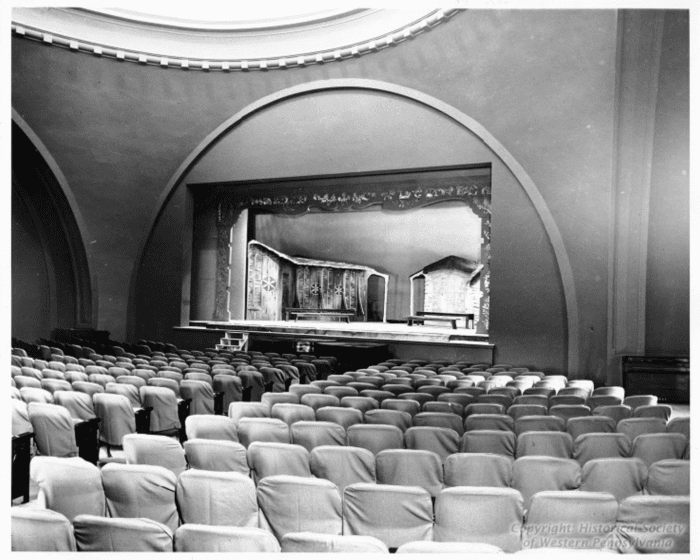 When the congregation moved to Squirrel Hill in 1951, the building was purchased and became the largest of the Playhouse theaters, the Rockwell Theater. Underneath the theater, in what was a former ballroom, was the Playhouse Restaurant which featured an ice cream parlor as well as its own water features. Of the three buildings, I have to say that the Tree of Life building is absolutely the most interesting of them, even despite the tragedy that happened at the congregation’s Squirrel Hill synagogue in the fall. 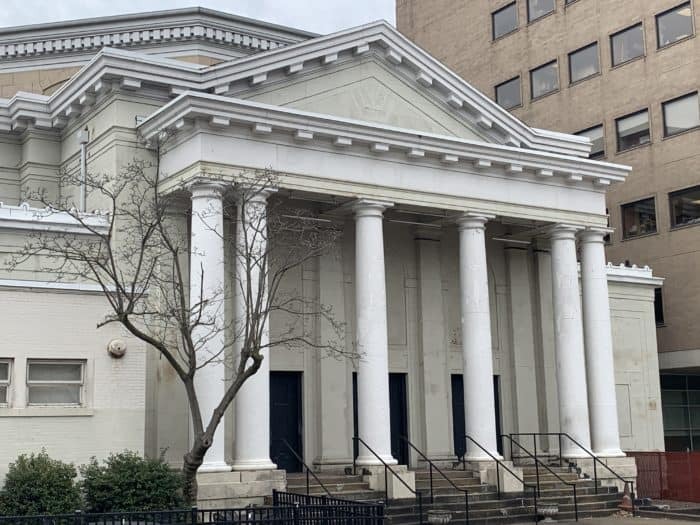 At the time the building was purchased by the Pittsburgh Playhouse, Tree of Life Synagogue was etched in the facade above the four white columns. A closeup of the cornerstone of the original Tree of Life Synagogue which reads Erected 5666. A cornerstone saying “Erected 5666” (which is for the Jewish calendar year of 1906) is visible on the right-hand side of the building. Additionally, if you stand across the street you can see an inlaid menorah at the top of the facade of the building. A menorah is visible at the bottom of the triangle above the name. It is not as visible now as it once was. Unfortunately, over the years, the menorah has become less noticeable and the Tree of Life name was removed from the facade. The cornerstone has remained and the current Tree of Life congregation has asked for it back when the building is demolished. The Tree of Life building originally featured stained glass as well as a domed ceiling, both of which have been removed or covered up as light is the enemy of the theater. The domed ceiling has been the bane of many sound designers over the years. 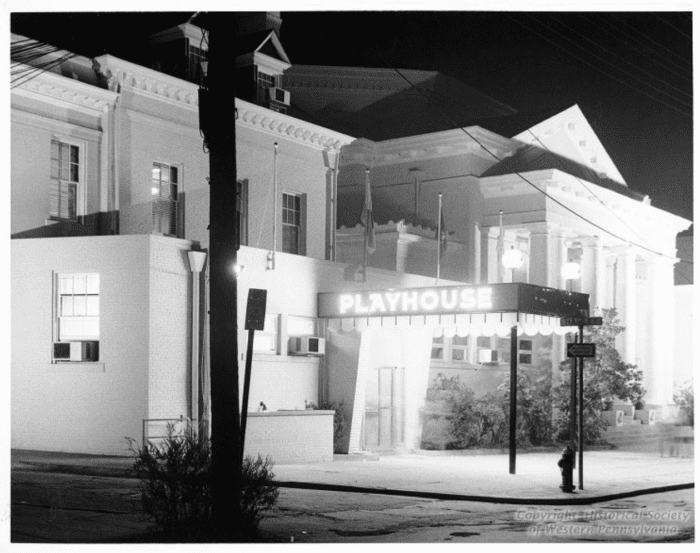 Over the years, the Playhouse had always experienced issues with finding proper funding. In the 1960s the problem reached a breaking point. In 1965, the Pittsburgh Playhouse was the first home to the American Conservatory Theater. However, the performers ran a large deficit before moving the troupe to San Francisco the next season. In the 1970s, Point Park University came along and partnered with the Playhouse which enabled it to remain a cultural entity. However, in 2013 it was announced that a new Playhouse would be constructed downtown, and the Oakland location would no longer be used. The curtain fell for the last time at the Oakland location for the last time in 2018. 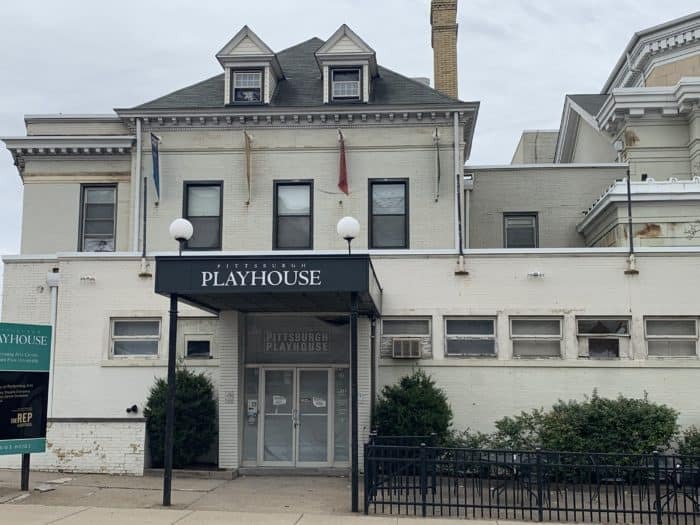 A photo taken in March of 2019 of the now-abandoned Pittsburgh Playhouse. “But what will happen to the ghosts?” I’ve read this comment several times in relation to the impending demolition of the old Pittsburgh Playhouse. In fact, there are reports of several ghosts who inhabit the Playhouse. The most famous of these is the Woman in White, who supposedly murdered her husband and his mistress before killing herself back when the building was still a social hall. She can be seen pacing around in Rauh Theater. Another ghost is John Johns, and actor who had a heart attack on stage and died in his dressing room in 1963. He can been see still wearing a tuxedo. Weeping Eleanor has never been seen, but can be heard crying at night. She and her daughter perished in a fire that claimed her Oakland row house that once stood where the Playhouse’s dressing rooms now are.